A newly synthesized α-galactosidase A (α-Gal A) is extruded into the lumen of the endoplasmic reticulum (ER) according to its ER signal peptide as well as other lysosomal enzymes and the secreted proteins. In the ER, most proteins are retained until they are correctly folded and assembled. Wild-type α-Gal A is folded correctly in a short time, and it leaves the ER and reaches the final destination lysosomes. In contrast, a single amino acid substitution detected in the patient with Fabry disease causes a high frequency of misfolding and retained in the ER. Prolonged retention of misfolded proteins in the ER leads to their degradation. 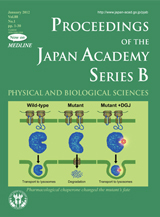 Dr. Ishii et al. discovered the technology to facilitate the correct folding of mutant enzyme by using pharmacological chaperone 1-deoxygalactonojirimycin (DGJ). The frequency of correct folding of mutant α-Gal A was increased by the binding of DGJ at an active site of the enzyme. 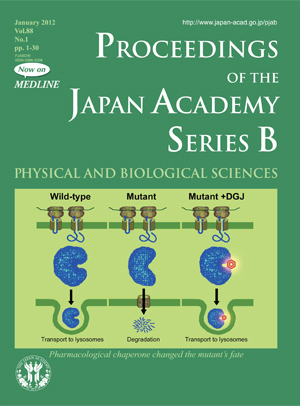 The mutant α-Gal A with DGJ was normally transported out of the ER and reached the lysosomes. Clinical trials of this technology for Fabry disease are being conducted. The concept of this technology may be broadly applicable to other inherited diseases.